If you are trying to lose fat or get into better shape you should know by now that about 80% of your fat loss results are determined by what you are eating and only 20% of your results are from your workouts. Because of this you will need to make sure you are eating healthy most of the time (I always recommend a few cheat meals or one cheat day per week). One of the main reason people struggle to eat healthy most of the time is because they run out of ideas of foods to eat or get bored of eating the same healthy meals day in and day out. Although I am pretty lucky in that I don’t really get sick of healthy foods I like easily, I still do need a variety in my weekly diet in order to keep at it eating healthy. I highly recommend you purchase some type of healthy recipe book or meal guide that will help you come up with more healthy meals to eat throughout the week. My favorite is the Metabolic cooking book which is all online, so you can view it on the computer at any time. Click here to check out that fat loss cookbook (will open up in a new window). Besides that healthy cookbook I also have a few books in the kitchen here that my girlfriend bought that are full of healthy meal ideas. The best thing about these fat loss focused cookbooks is that it opens up your brain to a variety of different recipes and healthy ideas. Sometimes I don’t follow the recipes exactly, but I get ideas from each recipe and create my own version to cater to my tastes or what ingredients I have in the kitchen. If your goal is fat loss I highly recommend that you take a look at Karine’s fat loss cookbook and try to make one new recipe per day. After trying a number of different recipes you will find a handful that you really like and that are easy to make (they become easier the more you make them) and that should help keeping you eating healthy every week. Sometimes a simple meal is the most convenient but set aside some time to try some new healthy meals and you should find yourself eating healthy more often with your new recipes. I also suggest trying to new foods that you didn’t previously enjoy. I’ve learnt to eat a lot of healthy food that I didn’t enjoy in past years (sometimes due to some recipe ideas, spices, marinades, etc). Today was a lower body and core workout day for me. I woke up and had my normal morning energy drink, followed by an eggs and turkey bacon breakfast about an hour later. Once my breakfast was settled I headed to the gym for my workout. My workout consisted of a few supersets and the following exercises: trap bar deadlifts, box jumps, stiff leg deadlifts, front kicks, split leg squat jumps, 1 legged leg press, hamstring curls, seated calf raises, hanging side leg raises, barbell oblique twists, lower ab ball crunches, and planks. Overall it was a good workout that lasted about 53 minutes (I time each workout so that is why I have it right down to the minute). After the workout I had my post workout shakes and my first pack of Animal Cuts (I’ve been off fat burners for a few weeks now and just started so that I finish up right before my vacation in February). 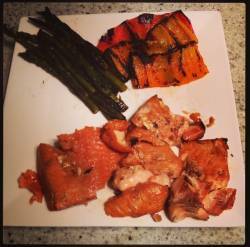 For dinner I grilled up some salmon, asparagus, and sweet peppers (seen in the picture). Tonight I will another snack before bed, and it will be another day of healthy eating to continue the good week. I also went to the grocery store today and picked up some healthy groceries for the next few days, which is key to making sure you stick to your diet. Anyways I hope you got something out of this article, and go ahead and try some different healthy recipes.